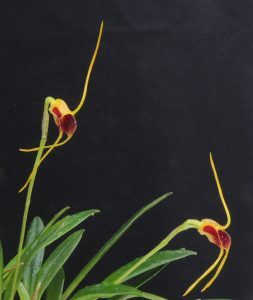 This week is miniatures week and one of our favourites is this masdevallia, endemic to cloud forests of Bolivia and one of the smallest masdevallias we grow. 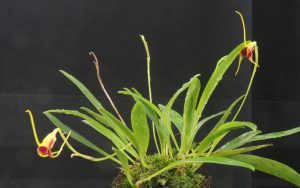 The plant shown is in a 3cm pot with 4cm leaves and 5cm flower spikes. 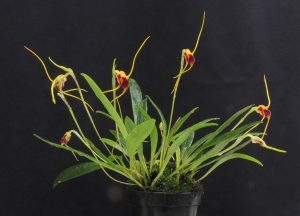 The flowers are large for the plant and long lasting. We grow the species both mounted and in small pots and it seems very happy both ways in a shady spot in our Cool Americas section. This is the plant last year and as you can see it now has nearly double the leaf count and a record of seven flowers simultaneously. We find that the secret of success with species such as this is our really heavy watering regime which meant it coped fine with the hot dry spell in from May to July. How many times a year does this orchid flower because It was flowering in August? It is a really lovely little orchid. It flowers two or three times a year.